Urbanism without effort is what happens naturally when people congregate in cities—based on the innate interactions of urban dwellers that occur with one another and the surrounding urban and physical environment. In Urbanism Without Effort, an e-book published under the Island Press E-ssentials program, Charles R. (Chuck) Wolfe examines how we can better understand the natural underlying relationships between cities and the people who live there. Throughout the book, Wolfe repeatedly reminds us of the importance of our own individual observations in creating the ‘urbanism without effort,’ which he believes is the key to creating lasting and sustainable places. Wolfe is a Seattle-based land use and environmental law attorney. He teaches land use at the University of Washington and contributes regularly to several publications including The Atlantic Cities, The Atlantic, The Huffington Post, Grist, seattlepi.com, and Crosscut.com—as well as his own blog, myurbanist.com. But this book is based on more than his professional experiences; as the son of a city planner, he has spent much of his life observing and thinking about cities around the world. As such, Urbanism Without Effort represents a professional, personal and intellectual adventure. Although steeped in traditional urban planning concepts, Wolfe bypasses the traditional academic planning debates and instead presents a resident-centred approach to urbanism, based on citizen observation. The book is augmented by a visually stunning collection of photographs taken by the author over a lifetime of travel to cities around the world. Wolfe’s keen eye for capturing the urban spirit of places highlights what unplanned places can teach us about creating high quality communities. The result combines a strong intellectual understanding of urban planning theory with a unique ability to capture the essence of everyday urban life. Wolfe believes that there is a fundamental relationship with people and cities that has always existed. This innate relationship is what makes people comfortable with where they live, who lives around them, and what goes on around them. As a result, “the best urbanism is often the urbanism we already have”—or in other words—‘urbanism without effort.’ This book looks at how we can enable our cities to evolve, while allowing for the “unexpected elements of human settlement and movement” that history has shown create some of our most cherished urban places. Urbanism Without Effort starts with the assertion that many contemporary trends in urbanism, such as transit-oriented development, complete streets or carbon neutrality, “underemphasize important cues from the rich backstory of urban history.” Just as ancient cities like Lisbon were once rebuilt on what existed before, Wolfe believes the many of the issues surrounding today’s cities are universal and timeless no matter how they are labeled or described, and argues that our current urban planning buzzwords are simply another generation of rebuilding. As a result of researching and writing this book, Wolfe now focuses “more on the implicit and organic evolution of urbanized areas rather than immediately embracing incomplete, popularized and/or prescribed urbanist labels, metrics, or points of view.” This viewpoint is a refreshing one in today’s urban discourse, where—too often—desired universal outcomes of sustainability and livability are advanced indiscriminately, regardless of context or location. Urbanism Without Effort is not a diatribe against tactical urbanism, or pop-up urbanism, but rather a critique of the ‘urban pied-pipers’ who propose uniform solutions for communities without thinking about the context of the place. The book calls on us to understand places “ideally based on personal experience and observation” which contribute to the urbanism we seek, and then carefully apply only solutions that work in the given local context and not just because other cities are doing it. This may result in trendy ideas, such as parklets or food trucks that may not naturally belong in a place working in a particular context. For example, he celebrates Vancouver’s Keys to the Streets public pianos as a current urban trend that works well in a recent guest post. One of the ironies of Urbanism Without Effort is it’s e-book format. Throughout the book, Wolfe celebrates age old principles in a very modern means. This paradox is not lost on Wolfe, indeed, he openly celebrates it. He says he has seem more community form through the possibility of contemporary technologies—including e-books—than through local book talks where people want to adapt his principles on a hyper-local scale. Wolfe really likes the ability of e-books to create community of interest with people from around the world. He has made friends and corresponded with people all over the world—India, South Africa, and Portugal to name a few examples—via email, Facebook and Twitter as a result of this project. Unlike many North American readers, this global audience can observe first hand how the ideas put forth in the book resonate in communities that can look back longer than 1860’s when cities like Seattle and Vancouver were founded. 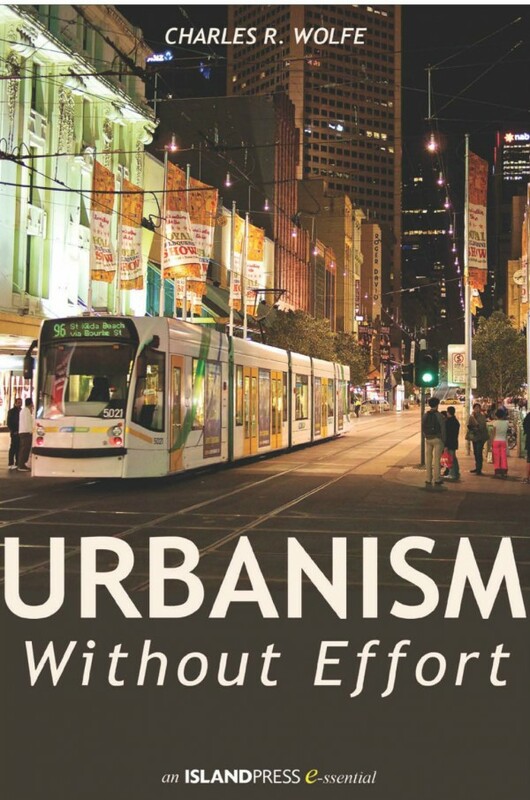 Urbanism Without Effort is a helpful book for city observers to pause and reflect on how their own neighbourhoods have evolved until now, and how they might be improved in the future. While this book lacks—and intentionally avoids—any prescriptive solutions to city design, it reminds the reader that the quest for great places is not necessarily found in the classroom or city hall, but in our communities and favourite places. Readers will come away motivated to find, experience and document their own favourite places find ways to apply effortless urbanism in their own neighbourhood. Yuri Artibise is a public policy analyst and social media specialist. Through his Yurbanism brand, he explores the ‘Y’ of urbanism by sharing ways to make our cities more livable, community-oriented places one block at a time. He currently works with PlaceSpeak, an online location-based community consultation platform. Nicely told, Yuri. and congratulations Chuck!! wonderful to see you are using your brilliant photos and ideas. I’ll get it immediately. Thanks Cindy! Long time no chat and hope you are well.